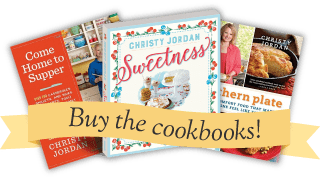 Introducing “Sweetness” – My New Book! 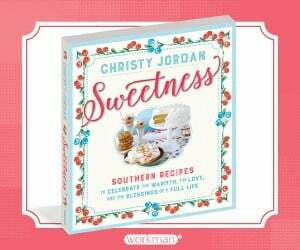 My latest book, Sweetness, hits shelves November 8, 2016. Click here to pre-order your copy now. Today I’d like to introduce you to a piece of my heart, my latest book, Sweetness. 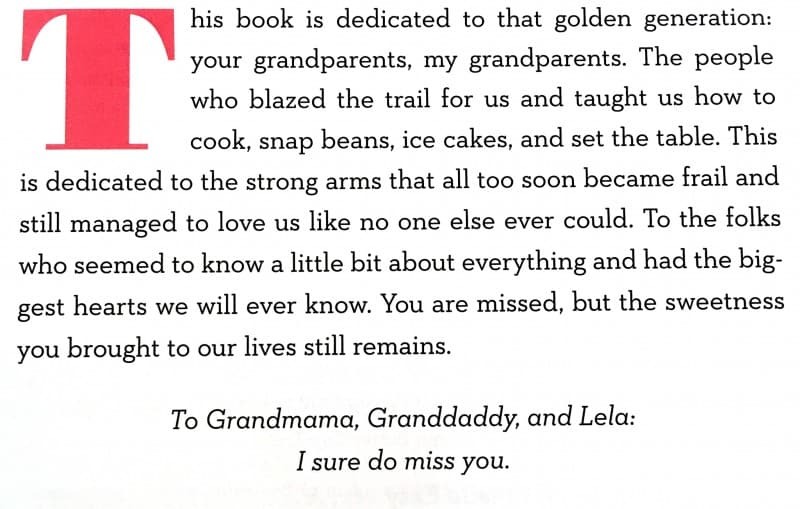 Sweetness is a cookbook with over 190 Recipes, which I dedicated to and wrote in honor of my grandparents. The 192 Recipes in this one are extra special. Several were found from digging deep into heritage recipe files and bringing back lost and nearly lost favorites from generations ago. When my Grandmama passed away I inherited her cookbook and found so many treasures to share with you from that! Some members of the Southern Plate family also shared cherished and nearly lost recipes from their grandparents as well. And the stories, always the stories….They are the stories of who made these beloved dishes. You’ll find stories from my grandparent’s childhoods along with photos of them back in the day. Stories Grandmama made me promise I would tell after she is gone. I can’t believe she is gone. I can’t believe they are gone. But I am so very blessed to have had them in my life and I’m grateful to you for letting me tell you about them in this book. If you can’t read the image below, click on it to open up a sharper version. Note: There are some lower sugar recipes as well as recipes that use sugar free ingredients in this book. There are lots of photos (but never as many as we would all like!) and they all have a vintage feel. Plenty of Pyrex was used and lots of fun vintage Pyrex clip art can be found throughout the book as well. 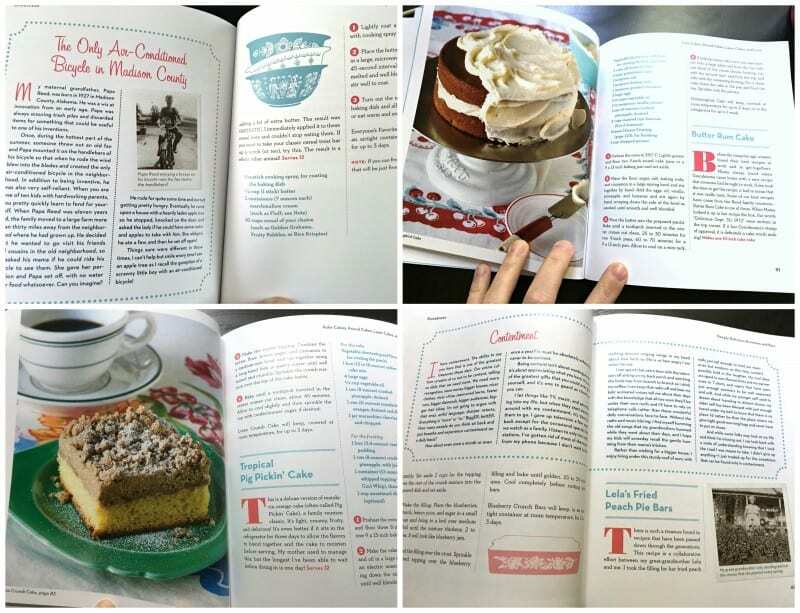 192 Recipes Total, plus an abundance of stories, family photos, and passages of encouragement – lots of encouragement. I poured my heart and a large portion of my soul and childhood into this book. The recipes are sure to become favorites for generations to come and it is my hope that the stories help us to remember and preserve the Sweetness of generations past. This is my third published book. I do not have plans for another book and would love your help in getting word out about this one. All pre-orders count as first day sales, so the best way to get on the Best Seller lists is to get as many pre-orders as possible. Note: There was an initial cover for the book that was changed. Some of these retailers may still show the first cover image but you’ll receive the one featured in this post regardless. Thank you so much for allowing me the honor of sharing my heart with you a third time. 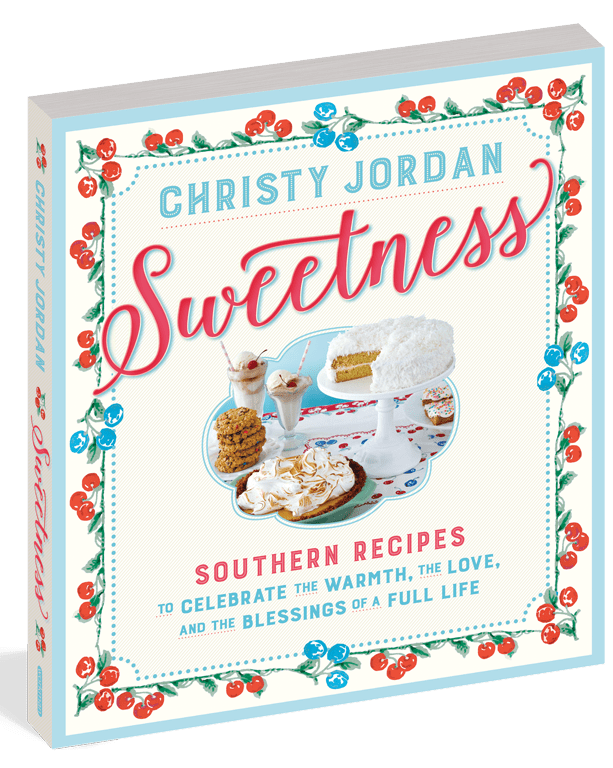 Sweetness: Southern Recipes to Celebrate the Warmth, the Love, and the Blessings of a Full Life was written to bring Sweetness to your table and bring to mind the Sweetness in your life. I hope you enjoy it. Christy, I am so proud of you. You have done what others only dream of doing. Thank you for presenting Southern family heritage and Godly wisdom mixed with good recipes and good memories. Today I pre-ordered your new book as a gift to myself! I also ordered Come Home To Supper as birthday gifts for two friends. Have only seen what you put on here and I must say, what a “sweet” tribute this is to your grandparents! What is your mama saying about it? Now I know what I am asking for Christmas. Second thought I don’t think I can wait that long to get my copy. Congrats Christy! You touched my heart. I , too have so many memories of my grandma who was slovakian and i continue today with many of holiday tradtitions my grandfather brought over from slovakian country. Past. Always a choice what we do. I like to remember my roots and heritage. You are so right Su!!! Christy, I can hardly wait to see your new book. When I was in Amazon one day I ran across it and immediately pre-ordered it. I have your other two bppls and have given several away as presents. This one looks fabulous. Love your stories and pictures. They are fascinating. Congratulations. Congratulations, Christy!! I am so happy for all of your success! Oh Christy! The new cookbook looks just lovely! I can’t wait to have it in my hands! I love your books, plan to add this to my collection too! Thanks so much! Christy: I have just been waiting for you to mention it so I could tell you that Amazon sent me an e-mail about it last Thursday very early, and I immediately pre-ordered the Kindle version. I’m looking forward to it very much, and I’m also happy that I FINALLY got to tell you I pre-ordered it! I was just busting waiting to tell you. I know it’ll be a good cookbook. 🙂 Thank you for the pre-order Kathy!!! I hate that you missed out on knowing your grandparents but I hope you got to know them through stories and memories that carried on their legacy! Christy: Thanks for the kind thought. That would have been very nice, but it just didn’t happen that way. The one thing I do have from my grandmother, is a recipe for “Farmer’s Rice”, which my aunt wrote out for me nearly 40 years ago; she and one of her brothers loved it and craved it, and couldn’t successfully make it. Neither could I, and I couldn’t find anything out about it whenever I searched cookbooks, or online for it. I gave up on it for decades and then a year or so ago, found the recipe and googled it. My Great-grandfather was first generation Pennsylvania Dutch, and I finally found out that this is a recipe similar to rivels or milk soup, and with the help of another aunt who also has Pennsylvania Dutch roots, I have been having much more success making something I’ve never had and have seen few, if any, pictures of. 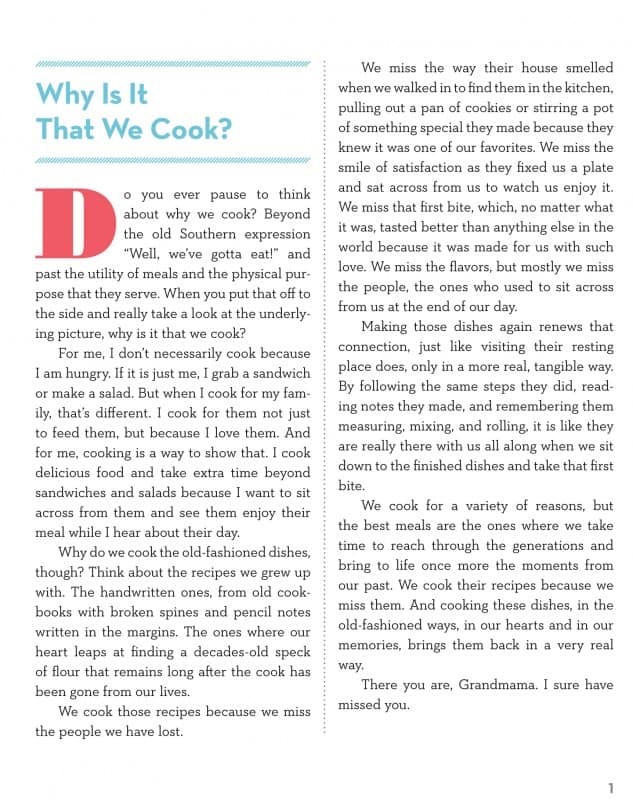 I think it’s a great comfort food, but I have absolutely no idea if I’m doing it correctly, but I treasure the connection to the grandmother that I never met, and who, according to my aunt, could cook anything. . . . except for a cake. 8) I might not make Farmers’ Rice as well as she did, but I can make a cake! Proud for you!!! Tickled for me!!! Can’t wait to get my own copy!! From reading your blog for several years, I know this book will be a treasure! Such a beautiful book cover and dedication. I love, love the preview pages and the vintage feel is so special and perfect. I am sad this is your last one, but I imagine there is just so much work going into writing a book. I will have to order so I then will have all 3 of your books on my shelf. Are these all new recipes not featured previously in your first book? Thank you Teresa!! I hope you enjoy it just as much as the others. Yes, most of the recipes are ones that have yet to be published. Your other 2 ckbks are my go to books. Pleased that you have added another one..I am sure it will as wonderful as the other 2. What a lovely name for your cookbook!!! Very endearing. I lost all my grandparents and parents many years ago. I still have vivid memories of prepping vegetables for storage with the womenfolk and going fishing with Daddy and the other menfolk. Sweets was something I learned to make at a young age for Daddy. I hope you enjoy the cookbook Patricia and I hope it helps to bring back some precious memories!! Hi Christy I am so excited your next book is coming out, yours are cookbooks I really enjoy reading, you put your heart and soul in these books and I would like to thank you for that, I hope you do not meet with to much negativity but if you do remember it is a reflection of the other persons personality and not you. Take care, stay strong we all wish you well love from Judi. Christy,what a beautiful cookbook.can not wait to order it.You may want to write another cookbook.about all those low-carb recipes,just a thought.Thank you for all you do. Thank you so much Lara!!! I read your post and enjoyed it so much reminds me of when I was a child that my parents would take me to see my grandmother ( father’s mother ). She always had such wonderful food. Can’t way to get copy. You always tell great stories of your family. 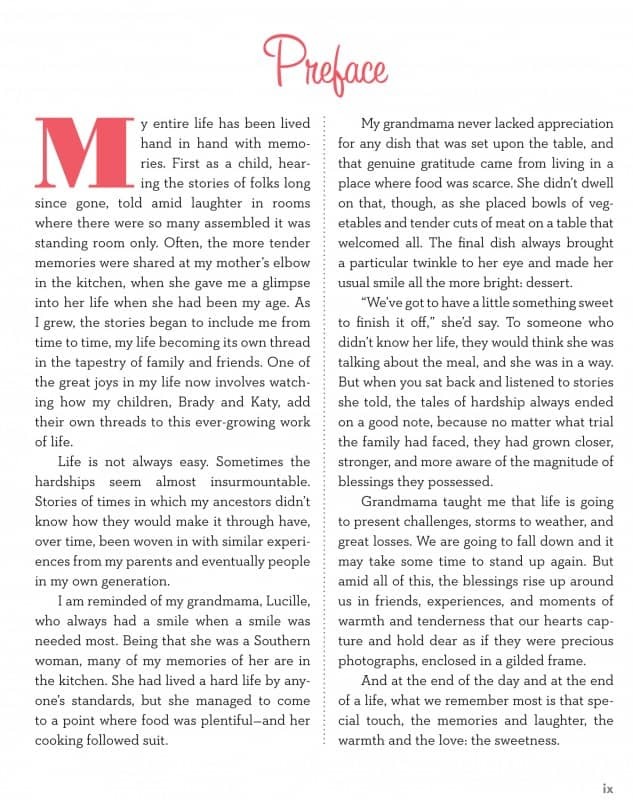 Looks fabulous, and I am happy you’ve included more stories about your family, your upbringing, etc…. makes this more of a “keeper” cookbook, worthy of many moves and not likely to end up in a garage sale….. thank you! I’ve got mine on pre-order! I pre-ordered my copy today! Can’t wait to get it!!! I’m so happy that I will have a new cookbook of yours to give as Christmas gifts this year. Of course I will get one for myself too! I can already see that it will be a great addition to my collection. This book looks great, who can resist sweets combined with your great stories?! I have enjoyed your other books and blog posts and really like the straightforward way in which you lay out the books and recipes. Thanks for doing this to remind us about the importance of food and family! Thank you so much for all of your kind words John!! !